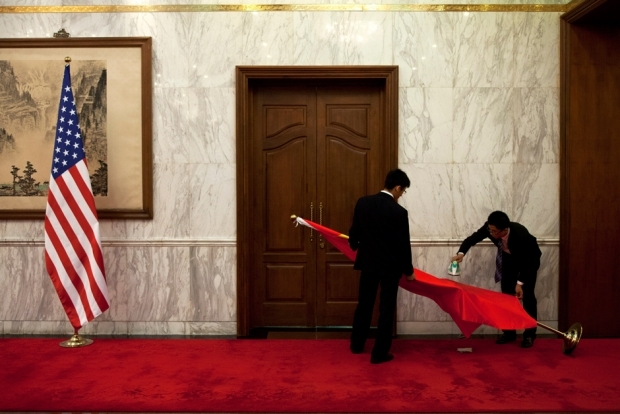 Workers iron a Chinese national flag after a U.S. national flag is placed in front of a Chinese traditional painting before a meeting between U.S. National Security Advisor Tom Donilon and Chinese State Councilor Yang Jiechi at Diaoyutai State Guesthouse in Beijing on May 27, 2013. What Should Obama and Xi Accomplish at Their California Summit? It’s an excellent idea for President Obama and President Xi to spend two days of quality time together at a private retreat in Southern California. Past meetings between Chinese and American presidents have been too short, formal and scripted for them to develop a genuine personal relationship and understand one another’s real intentions. Vice President Joe Biden and then-Vice-President Xi connected well when they spent almost two weeks traveling together and meeting the public first in China and then in the U.S.
Now Obama and Xi will have the same opportunity to develop the rapport that can help them solve problems and manage crises during their terms. Especially in a non-democratic country like China, the leader’s personal investment in good relations with the U.S. is one of the greatest diplomatic assets we can have. We shouldn’t expect any major agreements or other “deliverables” to result from this meeting. The goal of the encounter is to establish the personal relationship between the two leaders and explore ways to dispel—or at least better manage—the mutual suspicions that have recently been dragging down the relationship. Both leaders are seeking to reassure one another that their intentions are not hostile. Identifying and discussing common concerns like climate change, terrorism, and unstable regions like the Middle East are a better start than arm wrestling over contentious bilateral issues. The presidents should also be able to find common ground in their frustrations toward the provocative behavior of North Korean leader, Kim Jong Un. But the presidents shouldn’t shy away from the tough issues. The value of the meeting will be increased if they can explain to one another why certain actions by the other country—for example, Chinese cyberattacks on American firms and American surveillance activities in Chinese coastal waters—are considered highly offensive. Obama and Xi also can build empathy by discussing the daunting problems they both face at home. Obama will want to ask Xi what he expects to accomplish in the new round of economic reforms that are being drafted right now. And Xi will want to ask Obama whether he expects to ever get a budget agreement with the Congress. In explaining the political hurdles they face in their domestic initiatives, they can teach one another about the domestic political context in which they operate better than any book or intel briefing can ever do. The reason why so many Americans and Chinese alike look back on the 1972 Nixon/Kissinger visit to China and their interchange with Mao Zedong and Zhou Enlai with such nostalgia is that it was the last time that U.S.-China relations were visited by a breakthrough that truly transformed the nature of the bilateral relationship. Ever since, we have kept yearning that current leaders would again find a way to transcend existing differences, recognize the myriad number of growing common interests and begin to collaborate in a new and more active way. But alas, even as our two economies have become ever more intertwined, because of our our very complex history, very different political systems, opposing ideologies and the deep funds of mutual suspicion about the motives of the other that exists on both sides of the divide, Washington and Beijing have been able to do little more than maintain a reasonably functional level of mutual tolerance. Yet still we dream on, entertaining hopes that somehow, someday, some leader will be able to find the magic key, manage to turn it in the lock and open a new enchanting doorway to a more collaborative relationship. Now Presidents Obama and Xi have very hopefully decided to grab a few, last minute, informal days together at Walter Annenberg’s former estate, Sunnylands, in Palm Springs, California, as Xi returns home from the Carribbean and Mexico. Once again fantasies of a breakthrough between our two increasingly seminal countries are arising. But, at such a moment it is important to remind ourselves that electrifying breakthroughs – such as the ones effected by Nixon and Kissinger in 1972 or Richard Holbrooke with Slobodan Milosevic in 1998 – are not usually the way history progresses. It tends to progress haltingly in grudging increments, not in great leaps forward. As Susan Shirk correctly predicts, the best that can be hoped for is probably that the two leaders "can explain to one another why certain actions by the other country… are considered offensive." I think her rather modest hopes for the summit are prudent, if not correct. This does not mean, however, that the meeting will be worthless. If anything of consequence is ever to be accomplished by way of recalibrating how our two countries relate to each other, it will only be after a certain modicum of trust is established between the men at the top. And, this is a process that will not only take time, but special circumstances, namely, some quality time together, a commodity which is very hard to gain in our fast-paced modern world. It is also worth remembering that Xi Jinping is a very different person than his predecessor, Hu Jintao, someone who remained quite elusive to American leaders to the end. (In a decade at China’s helm, he never gave a single interview to a foreign correspondent!). Xi, on the other hand, is someone whose measure we have not yet had a chance to take. And, stripped of the protective armor of protocol, state banquets, 21 gun salutes and motorcades, the two-day experience at Sunnylands may yet reveal him to be someone of a more approachable and direct nature. Indeed, the fact the Xi is not now seeking the pomp and circumstance of a Washington state visit may suggest someone who is more self-confident, practical and down-to-earth, someone who does not need to have his ego curried by the niceties of a full-fledged state visit. In any event, if there is a re-set button to be found, it will doubtless reveal itself more readily at an informal setting like Sunnylands, where the two leaders will be sequestered without neckties and suits, or armies of security and functionaries. There they will have a chance to spend two whole days together in a congenial atmosphere in what will be an interesting litmus test for China’s new leader. Just by accepting such a venue for his first official meeting with President Obama, President Xi reveals himself as someone who is at least willing to dispense with the trappings and niceties of protocol and – we may hope – someone willing also to roll up his sleeves in a more informal way to see if he can forge a new and pragmatic kind of partnership with his American counterpart. Orville is right that the smart money bets against an “electrifying breakthrough” at meetings like these. After all, both President Obama and -- to a lesser extent -- President Xi must consider the need to sell any policy pivots to constituencies within their home countries. That said, the Obama-Xi tête-à-tête is immensely important. For the globetrotting leaders of the world’s most powerful countries, something approaching two days of dedicated interaction is a long time, and will surely provide ample chance for the building of a real personal relationship. If nothing else, personal affinity between the two would erect an important bulwark against potentially catastrophic misunderstanding. Charisma plays a role, albeit one too often discounted by foreign policy hands. Grassroots chatter suggests Chinese like the cut of Xi Jinping’s jib quite a bit more than his seemingly aloof predecessor. President Obama probably agrees. With a breakthrough unlikely, the next-best outcome is the beginnings of a shared vision for what U.S.-China relations should look like in the coming decade. Xi has made noise about a “new type of great power relationship.” But that could mean anything; it's up to these two men to fill in the blanks, before someone else does. There are lots of reasons to look with favor on the Xi-Obama meeting at Sunnylands, the Annenberg Estate in Rancho Mirage, CA. Let me offer a quirky first reason: the staffs are going to like it. As one who has seen at close range the grinding, soul-destroying battles over symbolic gestures, over choreography, over head table seating, over press release fine tuning, over state-visit ceremonial niceties, etc., I can almost hear the sighs of relief from both sides at the idea of a low-profile, low-ceremony meeting of two mature adults in a quiet place. And that staff uplift is likely to be a big plus, during and after the meeting. Ultimately, the worker-bees need to get along smoothly and communicate well if this U.S.-China relationship is to survive and prosper. Next, of course, desert California is far from Capitol Hill (though one of California’s most sensible Congressmen on China issues for many years, Rep. David Dreier, former Chair of the House Rules Committee, is now chairing the Annenberg-Dreier Commission on the Greater Pacific; his appointment was announced at Sunnylands in February, and we may presume he will be near at hand during the Xi-Obama visit). China has been, and remains, a subject not only of serious concern on and near Capitol Hill but of frequent, opportunistic publicity-hunting, and it is well that, at a time of great sensitivity, the engagement of the two Presidents not be made an occasion for explosive comedy, high or low. Again, I have seen at close range the magnetism, for people and groups with all manner of agendas and “messages,” of a high-profile, heavily media-driven event in a large American city, let along Washington, D.C. itself. Rancho Mirage will not offer that same magnetic field. On the issues, of course, there is much to discuss: Susan Shirk has already put her finger on many of them, and indeed they are no secret. Whether or not we swallow whole the “most important bilateral relationship” mantra (how recently it was applied to U.S.-Japan relations, followed, in former Ambassador Mike Mansfield’s memorable phrasing, by the two words “bar none”), the numbers speak for themselves, e.g. on which two nations are responsible for the biggest share of greenhouse gases. I’m comfortable with the general formulation that the U.S. and China, working together, may not be able to solve the great problems facing humanity, but it is certain that such problems cannot be addressed unless the U.S. and China work together. It’s always easy to write faux “policy memos” to top government leaders when they are preparing to assume their offices, or, as in this case, when they are preparing to sit down with one another, and seen from the inside such exercises usually seem superfluous. So I won’t pretend to be telling Messrs. Obama and Xi what they ought to do, think, or say when they meet. I would just offer a couple of observations for American observers. Remember “Ron and Yasu”? That was the chummy formulation that emanated (on the U.S. side) from some meeting between President Ronald Reagan and Japan's Prime Minister Nakasone Yasuhiro. It resonated with lots of Americans, including the media, for whom the hint of instant intimacy seemed to portend an easy resolution of tough bilateral issues. It didn’t, and I am pretty sure President Obama and his team will not indulge in any "Barack and Jinping" nonsense. Americans should expect none of that—in fact, we must hope for none of that. Running China, and trying to govern the U.S., is serious business. These two men are, moreover, essentially, strangers. Instant intimacy is out of the question, and any pretensions to it would be counterproductive in raising unrealistic popular expectations (and new opportunities for political satire). What ARE we to expect, then? Let’s say “hope for” instead. I’d say, if we’re lucky, a cordial press release indicating that these two leaders have personally dedicated themselves to a sustained effort at building on the positive dimensions of the U.S.-China relationship and working patiently at the many negative elements in it. That’s one thing. Next, possibly an announcement of one or more agreements to cooperate, at the presidential level, in ways that do not require heavy political lifting by the U.S. president. We are stuck in the partisan mud. Who among us would believe today that partisanship stops “at the water’s edge”? Nothing friendly that the U.S. president might agree to with his Chinese counterpart, at this moment, is likely to go anywhere if it requires Congressional signoff; we know that without my having to say it. So Mr. Obama’s staff is likely to be pondering what initiatives their boss can commit to, within his statutory authority, that don't require anything of Congress. Hopefully, in the usual staff-to-staff work that precedes any summit meeting between any two leaders, both sides are working on shared possibilities. But, just to wrap this up, I would say that the best results of this meeting might turn out to be unannounced altogether. The two countries, and their leaders, operate under the harsh glare of publicity and domestic politics. Next, perhaps, to whacking the IRS, China has been a top hot-button issue in US politics since the 1940s, in different circumstances, and particularly since 1989 (think of candidate Bill Clinton’s barbed pledge, aimed at President G. H. W. Bush, of “an America that will not coddle dictators, from Baghdad to Beijing,” and the furious assaults on President Clinton over China throughout his presidency). The growth of Chinese economic and military power in the past decade has given rise to periodic storms in American politics, as shown most recently in the 2012 presidential campaign (as crassly opportunistic, and ineffective, as those anti-China ads were). And in China, vast numbers of netizens— and plenty of commentators in mass publications—daily lash the United States for allegedly conspiring to block China's legitimate goals of “National Rejuvenation” and expanding global influence. Stock-phrase rhetoric about hostile “Western Forces” pollutes the public opinion universe in China, seemingly tolerated, if not encouraged, by the highest political authorities. What we should hope for, then, is actually more invisible progress: a quiet diminution of the constant stoking of hostile opinion, unannounced reductions in various kinds of dangerous and inflammatory behavior (cyber behavior is another obvious starting place), and the gradual use of “reciprocal unilateralism” — each country’s unilateral build-down from the current heights of angry tension without the slightest acknowledgment that the other side has compelled it to act—to cool current fires and establish the clear fact that finding accommodation is very, very high on each leader’s agenda. It will be interesting, for example, in the wake of Rancho Mirage, to see whether the endless derisory or insulting phrase-making about the U.S., in officially authorized media in China, diminishes; that would be a welcome signal. Neither China nor the U.S. is ever going to take an action demanded by the other side and then say, “We did it because you told us to.” People who entertain such dreams are living in a dangerous fantasyland. What we can hope for out of this rare private meeting is that two sophisticated leaders of huge and powerful nations, each with a very full agenda of domestic challenges and limited time to sit down together as they will do at Rancho Mirage, can dedicate themselves to reinforcing the positive foundations of their countries' bilateral relations and acknowledge, however privately, that keeping the spirit of cooperation alive between Washington and Beijing is in the best interests of both nations, whether it makes headlines or not. Let me chime in briefly. I think that one of the most important things that could come out of the Xi-Obama meeting would be for both presidents to stand up and speak in concrete terms about how and why the U.S.-China relationship benefits the people of each country. Neither president has made the case effectively to date. In the economic realm, for example, Xi Jinping could talk about the importance of U.S. investment, trade, and technology transfer to China’s economic development over the past thirty years, the role of U.S. NGOs in promoting civil society development, and the importance of the United States in securing trade routes for Chinese goods. President Obama could speak to the Chinese purchase of treasury bonds, the potential of Chinese investment in the U.S. economy to bring real jobs, and the role of Chinese-manufactured goods in keeping prices down for American consumers. If there is any reality to an impending partnership on climate change—one has been rumored around the issue of promoting energy efficient buildings—this would be the time for the two leaders to talk about it. It doesn’t do any good to inflate the relationship beyond where it really is or is likely to go in the near future. At the same time, it isn’t healthy to focus solely on the ever-increasing number of frictions between the two countries. If the U.S.-China relationship is ever going to improve, Presidents Xi and Obama will have to dig deep to find areas where each country has contributed to the prosperity or social well-being of the other and begin to lay the foundation for the “new type of relations between major powers” for which everyone seems to be clamoring. I hope our president avoids signing on to “a new type of great power relationship.” This is Chinese code for the U.S. preemptively yielding to what China views as its legitimate security interests. These interests are quite expansive—acceptance of the Chinese regime as it is, human rights violations and all; acceptance of China's territorial demands in the East and South China Seas; deference to China’s views on the rules governing international trade, currency, climate change, humanitarian intervention, and so on. In the eyes of Chinese policy makers, the U.S. engages in “old type” great power politics—Cold War politics—when it supports pro-democracy groups, promotes Internet freedom, conducts “Freedom of Navigation operations” in the South China Sea, and sells weapons to Taiwan. I’m all in favor of accommodating China’s rise in a way that also preserves the security of the U.S. and its friends and allies. But I think a new equilibrium between American and Chinese interests will have to be achieved by painstaking work on concrete issues over a long period of time, often in a contentious environment. We will not advance matters by agreeing to a fine-sounding principle that will itself become a source of misunderstanding and disagreement. I don’t know what Xi means, but I suspect Andy is right. We have seen a foreshadowing in the Chinese elaboration of “core interests” since 2009. One can confidently add themes like non- interference, state sovereignty etc. I am in favor, of course, of this shirtsleeve, private, remote location meeting—indeed I proposed exactly this scenario in a speech I delivered at the Woodrow Wilson Center in April. Obama should ask Xi what he means about this; clearly it would be good to avoid the “Thucydides" Trap” of rising and established powers—in history war leads peace 12 to 3. He should also ask about the meaning of “the Renaissance of the Chinese nation/dream.” Xi should ask Obama about our Asia policy and how we really feel about China’s rise. As for what to do in the context of these strategic exchanges, the issue of trust, how to manage the relationship, priorities etc., my views, as expressed in my speech, generally track with the comments that have been submitted. To circle back to Andy’s comment, it is crucial to avoid further misunderstandings as well as to seek progress. Obama should therefore be wary, but also open- minded, candid, sincere, and not prematurely cynical.